Published: 2014-02-11, by Ana Gracia. WritePad is a comprehensive text editor for iOS devices with many features included. First of all, you should select your preferred language (English, Dutch, French, German and some others are available). When View mode is activated, you can scroll the text by susing the strokes, as well as dial numbers and access to urls y simply clicking on them. On the other hand, in Handwriting mode, you should write horizontally and complete the words in every sessions in order for the dictionary to work properly. Scroll up and down using stroke gesure and discover all the complete features by reading the instructions inside the application. Open the documents easily by clicking on them and don't worry about saving them, as it's automatic. The app is very complete and easy to use, we haven't found any problems regarding its usage. Controls work perfectly well and design is minimal and appropriate. In addition, text recognition works really well and adds a few alternatives in case it doesn't get it right the first time. This is a great tool for adding notes and writing stuff for a later use: you can synchronize your docs with other apps like SkyDrive, Dropbox and iTunes, which means you can also access it from a computer to continue the work. Email messages are also supported, of course. Stan Miasnikov is the developer of WritePad, a well-thought and usable application that allows users to express themselves in handwriting. WritePad is a text editor for iPhone that utilizes advanced handwriting recognition input for the English language as well as iPhone keyboard for text entry, and includes spell checker, context analyzer, and standard editing operations such as copy, cut, paste, etc. WritePad’s primary handwriting recognition-based input method integrated with the text editor and developed specifically for iPhone and iPod Touch. It recognizes cursive, PRINT, and mixed handwriting styles. To enter the text you can simply write with your finger or a stylus (such as AluPen by just|mobile) on the iPhone screen in either landscape or portrait mode employing your own handwriting style. 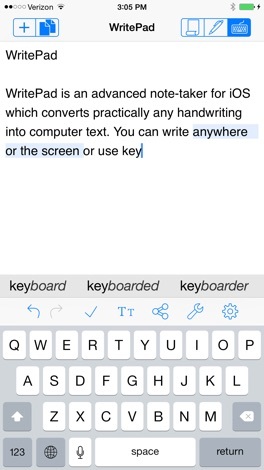 It also allows easily switching between the handwriting recognition and the standard iPhone keyboard. The Shorthand feature offers a quick and simple way to insert often-repeated text and performs standard editing commands by writing the Shorthand name and drawing a circle around it. You can add new or modify Shorthands using the Shorthand Editor. 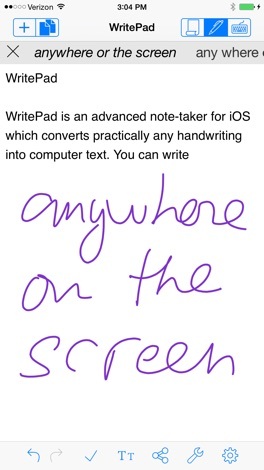 With WritePad you can create text documents and store them on your iPhone. The built-in HTTP server allows you to exchange files between iPhone devices connected to the same WiFi network, or to upload files onto the desktop PC using the Internet browser. You can also send emails directly from WritePad and use copy/paste to transfer text between WritePad and other applications. In addition, you can use the built-in interface to the Bing Translator to convert your documents to other languages. * Create, view, and modify text documents. 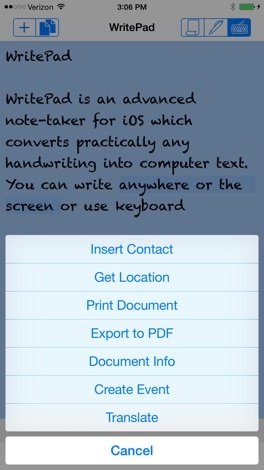 * Use advanced handwriting recognition engine or iPhone keyboard for text entry in landscape or portrait mode. * Organize WritePad documents in the hierachical folder structure and search documents for characters or words. * Synchronize WritePad documents with Box, Dropbox, SkyDrive, Evernote, iCloud, and iTunes. * Send text files via email or transfer files from (to) another iPhone. * Improve your productivity by using built-in spell checker, context analyzer, and shorthand features. * Use built-in HTTP file server to exchange text files between device and desktop computer. * Translate your documents to other languages using built-in support for Bing Translator. Write in handwriting and let the app recognize the words. 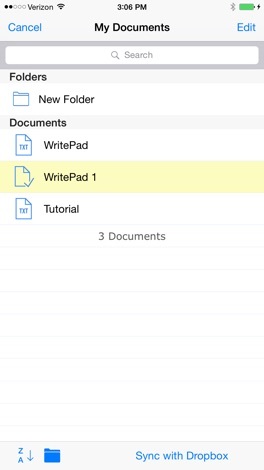 WritePad is a comprehensive text editor for iOS devices with many features included. First of all, you should select your preferred language (English, Dutch, French, German and some others are available). When View mode is activated, you can scroll the text by susing the strokes, as well as….